An early morning convoy of shiny rigs into Mystery Creek Events Centre kicked off the third and final day of the Transport and Heavy Equipment Expo 2013. 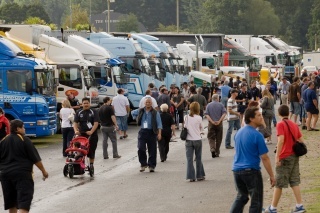 The crowd arrived early and stayed all day taking in not only THE Expo show but also the additional 80 trucks participating in the spectacular Show ‘n’ Shine. The Show ‘n’ Shine gives drivers a chance to show off the artwork and lights that transform a truck into a piece of art while competing for various awards and an attractive prize pool. Supreme Award winner Scott Young won a $2000 tracking system from event sponsor, ITS Intelligent Tracking Solutions. Scott drove the family-owned truck up from Ohakune this morning and said he was pretty amazed to have won the awards. The 1984 vehicle was the first 8-wheeler Mack Cruiseliner in the country and is still owned by the original owner, Scott’s father. “She’s only ever carried carrots, potatoes and the occasional tractor but is pretty much retired now and just does trips from the field to the packhouse,” said Scott. With gate numbers for the final show day at just over 6000, event organisers are very pleased with the total attendance of 13464. One of the many sites that saw a constant stream of visitors was the best medium outdoor site award winner Kubota New Zealand which had an interactive display featuring a mini excavator. NZ Kubota Manager (CB Norwoods Distributors Ltd) Ian Massicks said they had enjoyed three great days at THE Expo but was pleased to have received more enquiries on Saturday that the previous two days put together.